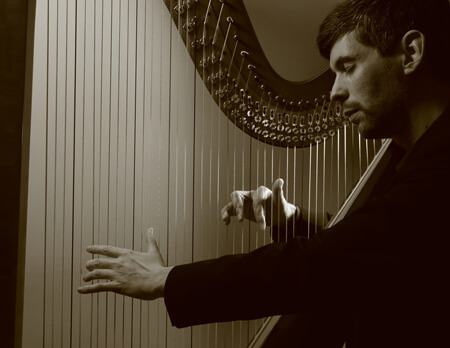 Harpist/composer Josh Layne has been called a ‘harp genius’ and a ‘consummate musician’. As a performer he has given solo recitals across Canada, the US, and in Europe and South America as well as giving performances of five of the major harp concertos. Josh’s performance of the cadenza from Handel’s Concerto for Harp has received over 150,000 views on YouTube. Josh has been praised for both his virtuosity and the sensitivity of his playing. He has released four CDs of solo harp music, most recently Passage: music for solo harp (2013) which includes his own original compositions plus music by Bach, Beethoven, Fauré, and Renié . In the fall of 2010 Josh started a biweekly video series on YouTube called “Harp Tuesday”, where he talks about various aspects of playing the harp – from your first lesson, to in-depth looks at advanced music. His channel has now had over half a million views. You can find him on YouTube at http://www.youtube.com/joshlayne77.